Our vibrant school communities are showcases of the God-given abilities of our students. We invite you to join us for a concert, play, athletic contest, chapel or other school event. Check the links to the school calendars for more information. A spin on our Annual Golf Tournament... 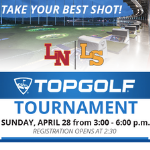 The Lutheran High School Association TopGolf Tournament will be held on Sunday, April 28 from 3:00 - 6:00 p.m. Registration opens at 2:30.